Browse through the news headlines in Pakistan over the past few years during the winter months and not a week goes by without a report of a road accident that has claimed many lives. Read a little bit more and you’ll find that weather condition, in particular fog, was a major contributing factor. This past week in Khairpur, Sindh a head-on collision between a bus and trucks resulted in over 50 deaths. One news report suggested there was a slight fog at the time of the accident. 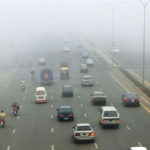 Each year the Motorway in Punjab gets closed for several hours and sometimes even a few days because of Fog. A study by World Health Organisation (WHO) suggests that road accidents are one of the leading cause of death among young people in Pakistan. While the most obvious bit about driving is to ensure that you have a road-worthy vehicle and that you are physically fit, on long drives or even during difficult weather conditions this is paramount. — Drive slowly and keeping a watch out for parked or stranded vehicles. — If you feel someone is driving too close to you pull over when possible and allow them to move ahead. Do not speed up to move away. — Avoid sudden burst of speed even if the area in front of you may appear to have better visibility; you may find yourself caught in thick fog beyond it. — If for any reason your vehicle comes to stop, switch on the hazard lights and move away from the carriageway as soon as possible. — Do not attempt to move a stalled vehicle from the carriage way by pushing it as you could be struck by cars come from behind. — Always watch your speed; you may actually be going faster than you think. Speed thrills but kills and in difficult weather conditions it’s an accident waiting to happen. ← Do you have a winter safety plan?